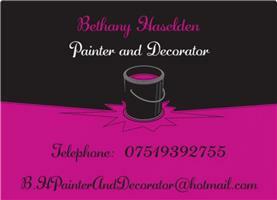 Bethany Haselden Painter and Decorator - Painter/Decorator based in Billingshurst, West Sussex. Hello I am Bethany Haselden, a female painter and decorator based in West Sussex. Services include: free quotations, thorough preparation, stripping and applying lining and wallpaper, applying a variety of different paints to suit the needs of the job such as emulsion, oil based paints, stains and treatments. I offer free follow up meetings whether quotation has been agreed or not to discuss any queries you may have. Most importantly I offer a clean and tidy work space and a stress free environment so you don't need to worry about a thing. I am trustworthy and passionate about my work to give you the finish you deserve at competitive prices.